The most hypocritical government in Australian history? two part series, Alan Austin examines the Government's wasteful spending. 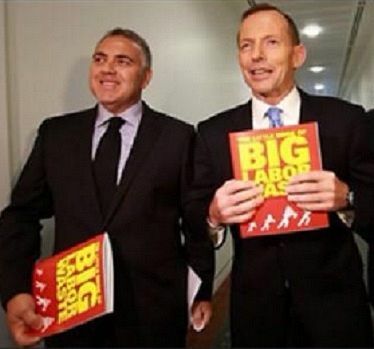 Treasurer Joe Hockey’s first budget by has failed on several levels. It has not generated enough revenue. It has allowed extraordinary waste. the poor. And it has invited global derision. Labor, Greens, PUP, independents or anyone else are spurious. The Bank said this was not needed. Treasury said it was not advisable. Michael Pascoe claims this was a trick to make Hockey look good. The excessive cost, including of disposable orange life boats, is impossible to measure precisely. It is multiple tens of millions per year. the community while claims are processed. The Government comprehensively lost last week. The exercise was a monumental waste of time, money and human resources. Australia pays $40 million per year plus all extra costs. For what? Annual cost at least $500 million. An extra $630 million has gone to security agencies to deal with the threat of "home-grown terrorism" which Australia’s involvement in Iraq foments. $12.4 billion has been allocated for these problem-plagued American stealth jets. Not the most cost effective option. Defence is spending more than $500,000 on marble panelling. Carrara marble, from Italy. These include celebrity speakers and a full tendering process to acquire a multipurpose knife for camping out. Estimated at $1 million per day. Another political vendetta squandered an estimated $61 million. This pays some businesses to reduce carbon emissions but frees others to increase theirs. The waste is about $2.55 billion over four years, plus costs incurred thereafter. Money is now available to train priests and other religious workers and for school chaplains, while funding for non-religious counsellors is cut. Federal funds are now available for homeopathy and Bach flower therapy. His $500,000 bullet-proof BMW is part of a $6.2 million outlay, vastly more than for Australian-made alternatives. unknown because the Government is withholding the information. that VIP jets were “probably cheaper” was shown to be blatantly false by an ABC fact check. High salaries were secured for Sophie Mirabella, Tim Wilson, Alexander Downer and others. A department axed by the Government continued to pay the top bureaucrat $7,000 a week for months until another role was eventually found. Fat cats receive outrageous bonuses on top of already bloated salaries. Charges of $65,000 were incurred when Abbott refused to live in the Forrest house rented for him during the 2013 election caretaker period. Lavish renovations costing a staggering $6.38 million were approved in December. That is double the original estimate and more than the cost of demolition and rebuild. $10,827 went on a coffee table. Treasury spent $36,005 on a conference table for the November summit in Brisbane. That conference table was made in the ACT. So the Government spent another $26,298 shipping it to Brisbane. Why did the tender not stipulate assembly in Brisbane? After the table had been built and transported to Queensland, chairs were also bought in the ACT – for a staggering $68,525. $24,000 was then blown in a few minutes of G20 koala diplomacy. Sydney until discontinued in December 2013. These include $15,442 for Attorney-General George Brandis’ bookcase. Joe Hockey spent $50,000 to fly a celebrity chef to Washington to cook one meal. George Brandis is among other offenders. This cost a poultice but achieved only disruption to an already stressed community. The Yolngu would have benefitted far more had Abbott stayed in Canberra and not slashed $534 million from their meagre programs. to buy and build assets, not sell them off. A double waste. $500,000 was spent to help sell – unsuccessfully – changes to higher education funding. Trying to defend the widely resented university changes cost $14.6 million. engaged on border control, costing at least $8 million annually, and many other spin merchants elsewhere. According to Fairfax, just seven departments spent $1.2 million on "market research" in four months last year. This is up from $12.2 billion in 2012-13 to $14.7 billion in 2014. With more to come. only utterly failed there, but blew out its own $1 million budget by 150%. been just as dismal on the revenue side, perhaps even more destructive. be examined in part two, coming soon. Alan thanks colleagues Sandi Keane and Lyn Bender for valuable input into this series. You can follow Alan on Twitter @AlanTheAmazing.